What is the Color Corps? 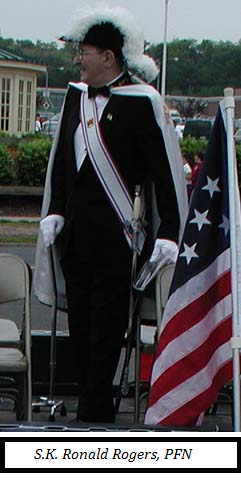 The Color Corps is the most visible arm of the Knights of Columbus. These are the men in the “funny” hats (correctly called Chapeaus, based on hats worn by U.S. naval officers at the end of the 1800’s) that march in parades and participate in funerals, wakes, and other religious ceremonies. The Color Corps is led by a Commander and is made up of two parts the Honor Guard and the Color Guard. The Honor Guard takes part in Civic and Religious functions; it is made up of all the members of the Color Corps who have learned the Manual of the Sword. While the Color guard also carries out these duties, the Color Guard is responsible for caring and displaying the flags in parades and ceremonies. The Color Guard is drawn from members of the Honor Guard that have mastered the Manual of the sword. Being the most visible arm of the Knights of Columbus, the Color Corps has strict uniform guidelines. Plain White Tuxedo Shirt with collar. Social Baldric, worn under the jacket when not in regalia. Black Chapeau with white or appropriately colored plume. Black Cape lined with appropriate color of rank. Color Harness, for Color Guard use only. The Commodore John Barry Assembly has a sizeable color corps, averaging about 20 members divided between the Honor Guard and Color Guard. Currently the Color Guard carries four flags: The United States Flag, the Vatican Flag, the State of Connecticut Flag, and the Flag of the Order. Since 1999, we have offered a “Regalia Fund” to help new members of our Assembly become active in the Color Corps. Through this plan the assembly purchases all of the necessary regalia, while the member purchases the tuxedo. The individual brother sir knight then pays regular monthly payments to the Assembly, interest free, until the debt is fully paid. 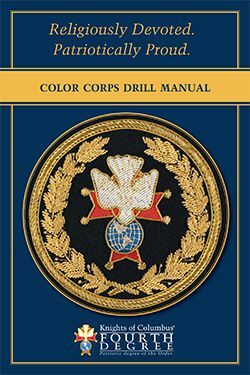 Membership in the Color Corps is open to any member in good standing of the 4th Degree, as long as their Assembly has a Color Corps. All members of the Color Corps must be trained regularly and certified before they can take part in any functions. Once certified the men must be re-certified every two years to maintain their position in the Color Corps. ​What do the different color capes mean? The Regalia depicted above will be retired effective on June 30, 2019 and be replaced by the uniform below. ​The uniform, sans Baldric and Sword are for all 4th Degree Knights and the uniform with Baldric and Sword will be worn by the Color Corps/Honor Guard. The new uniform may be worn at anytime going forward from now. Please check with your Color Corps Commander as to which to wear to events covered by your Assembly.